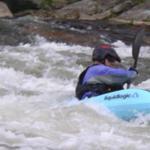 This season on Kibler Dan-1, which starts up at the Pinnacles Hydro Station has been a excellent year. Its been at least 8 to 10 years since we have had water consistently. Rains have been plentiful this year after 8 years of drought. The Dan begins above the hydro station in the Meadows of the Dan high up the mountain above where springs form the headwaters of the Dan river. Flowing from two reservoirs up the Pinnacles of the Dan gorge the water is deverted by flume to the Pinnacles Hydro Station located at the end Kibler Valley Virginia. Here section 1 of the Dan proper begins at to outflow pool of the hydro powerstation starting out with a nice initialy creeky run just below the outflow. This run is basically dependent on releases which occur due to power needs or scheduled recreational releases when there is adequate water in the reservoirs. This year rain and water levels in the reservoirs have been excellent and provided a both power releases and consistent recreational releases with many been full 9,000kw flows (releases on Dan 1 are rated in kw output of the power plant with 9,000 kw being a fairly full release and 7,000kw being pretty much minimum flow for paddling). With this years flow I have probably run this more than I have in many years. Being only about 30 minutes away for me its pretty much in my backyard. The run is a creeky 2+ to low 3 for the first half mile and the remainder of the run is considered class 2. 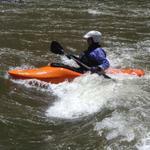 For many regional paddlers in the Triad area for NC this is a convenient day trip-local run. 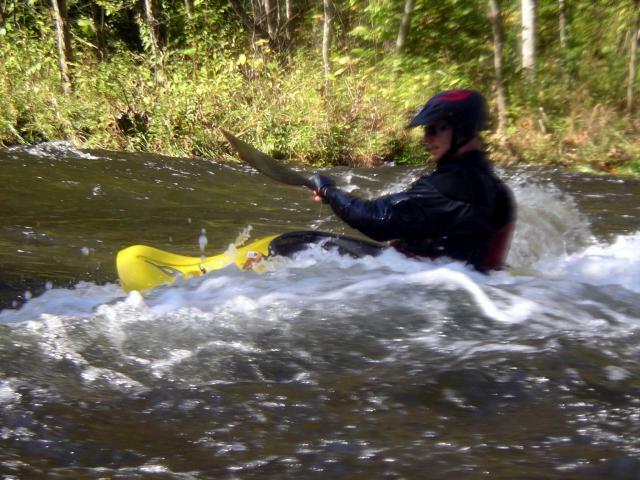 Saturday May 16th, 2009 – did an OC-1 run in on Kibler as I had not been in my open canoe during the winter. Joining me was Mike H. in k-1 and Steve H. in k-1. I came back on Sunday May 17th and did a k-1 run joining up with some of the SRVCC folks for the day. We had good releases. Again on Saturday June 6th, 2009, I joined Steve H. k-1 for a run in my k-1 creekboat, getting in a day working out and playing the river on a full release. July 4th, 2009 rolled around on Saturday, with a warm and sunny day and there was a large turn-out at Kibler with probably 30-40 people at the put in when I arrived for another 9,000kw release. While most rivers had begun to drop regionaly, Kibler had gotten more rain recently as was still releasing well. I did this run in my k-1 playboat, joining Tim T. k-1, Jim Van L. k-1, and Tease oc-1 for a nice day on the river. Saturday, July 11th, 2009, being limited on travel due to other commitments on Saturday morning, I arrived late about 1:30pm and joined the tail-end of a group of SRVCC & TRR paddlers putting on. 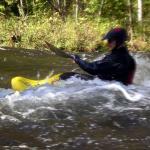 Paddling my k-1 creekboat, and joining Trent oc-1, Tim T. k-1, Jim Van L. k-1, and others. I went for a skills workout, and played the upper section hard along with a couple of play-spots and waves below, getting in plenty of surfing, 360 spins, and working moves for a good workout. Darron P. called me on Saturday 7/18/09, saying that Will and Martinez wanted to see what Kibler was about, so that afternoon we all met up and made our way up to run Kibler. 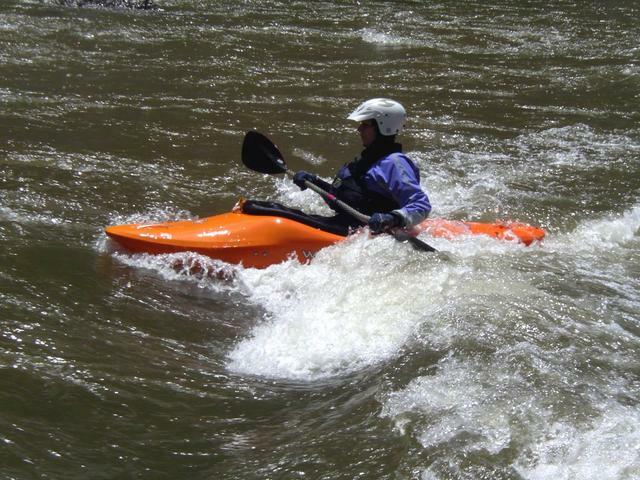 Great day with a full 9,000 cfs. All of us in K-1 for a nice warm sunny run. On our first run we played about every spot worth working along the way hard from the powerhouse down to the picnic tables. Afterward, Martinez opted to hang at the take out and Darron, Will and I all did quick speed run down. It has been a nice year for Kibler hasn’t it? I parked my kayak on river right and climbed on the big rock at Basketball Falls just about the time your crew came through. I didn’t know that was you until I just read that you were with Tim, Teresa and Jim. I wish I had pulled the camera out a minute or two sooner because Jim Van L had the nicest boof I saw all day. I went back to see if I had any photos of you that I could share, but all I had was a brief clip of you leaving the eddy to go help one of the swimmers. I did shoot a lot of footage of Tim and James surfing around that time though. You do a great job on your blog and now that I know who you are, I’ll make sure to say hi the next time we cross paths on the water. SYOTR, Delane.